Someone once said - marriage is an adventure, like going to war - how different can a proposal be then? 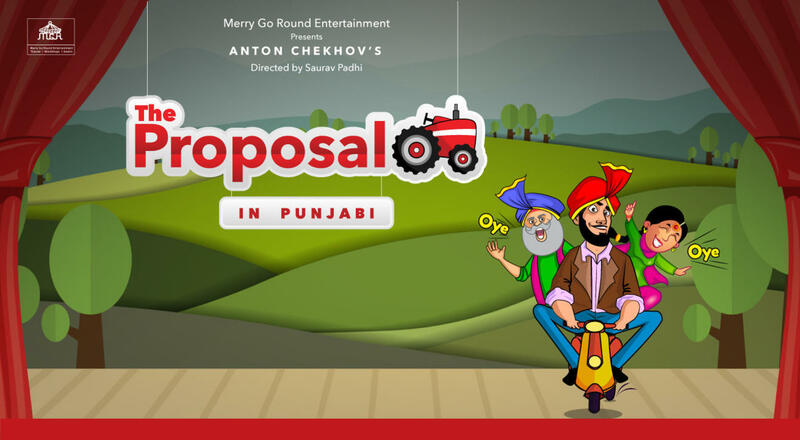 Based on Anton Chekhov’s hit play 'The Proposal', this Punjabi adaptation explores the same plot but with a lot of Punjabi tadka. This is the first such adaptation of this classic play, conceptualised & directed by Saurav Padhi. The Punjabi translation has been penned down by Jagdip Singh. Adding to the flavour, this play also features a popular, but withering, traditional comic stand up art - 'Punjabi Phands' - in a contemporary avatar. The lyrics have been penned by Jagdip Singh & Rishabh Tripathi. Confusion & chaos prevail when the innocent Veeraji is cleverly steered by his man Friday Ramu to ask for their neighbour's daughter’s hand in marriage. Little does Veeraji know about Ramu’s own love interest, Dulari, the neighbour's domestic help. The neighbour, Jaman Singh is more than happy to agree to the alliance & calls out to his daughter, Nimmo. Nimmo is a stark contrast of her sugar coated image created by both Ramu & Jaman Singh. Veeraji (now left alone in the room for a friendly chat with Nimmo) begins a polite conversation that leads to a situation where the battle lines are drawn. Rajiv Khunger - An engineer by profession, actor by passion, Rajiv has been a part of Merry Go Round productions for the past 3 years. The man redefines passion and leaves everyone awestruck each time he's on stage. Jagdip Singh - Jagdip is a script writer, actor and singer associated with Merry Go Round Entertainment for the past 2 years. He has adapted and acted in the comedy play Harishankar Parsai’s 'Anshan'. Pawandeep Singh - Pawandeep is a theatre enthusiast involved in various theatre productions as a production assistant and actor in plays like Khabsoorat Bahu and Page3Not3, He has also been associated with various other theatre groups like Dramatech and The Company Theatre in similar roles. Nidhi Upadhyaya - Nidhi is a born drama queen and has only recently started her formal journey as a theatre artist. As part of Merry go Round, she has been a part of two rib tickling plays – Harishankar Parsai’s Anshan & Premchand’s Do Behnein. Ankit Kumar - Ankit is a theatre actor associated with Merry Go Round Entertainment group. He has done two plays- Do Behne and Anshan with them and has also worked in short films done by the same group. Rajesh Gandhi - In a career spanning around 20 yeas as a performer, Rajesh has been a part of many theatre, television and mainstream cinema productions. Nitin Arora - Nitin has been an active participant in theatre since his graduation days. He has performed multiple Nukkad Nataks (street plays) and Ekankis (One Act Plays). Currently, he is a part of Merry Go Round Entertainment. Srishti Chhabra - She is a theatre artist associated with Merry Go Round Entertainment theatre group. She has performed in Do behne and Anshan. She has also worked in short films with the group. Currently she is also assisting the current production of Proposal along with acting in it. Saina Singh - Saina has been performing for nearly a decade now as a dancer. She was a part of the Musical Theater Masterpiece ‘Jhumroo’ which was staged at the Kingdom of Dreams. She is currently associated with Merry Go Round Theatre Group and is exploring the art of theatre acting. Saurav Padhi - An actor, writer and director with Merry Go Round Entertainment, Saurav has been in the theatre circuit for nearly a decade and is also a theatre trainer. He has trained close to 100 artists (beginners as well as advanced) and directed theatre productions as well as short & ad films.